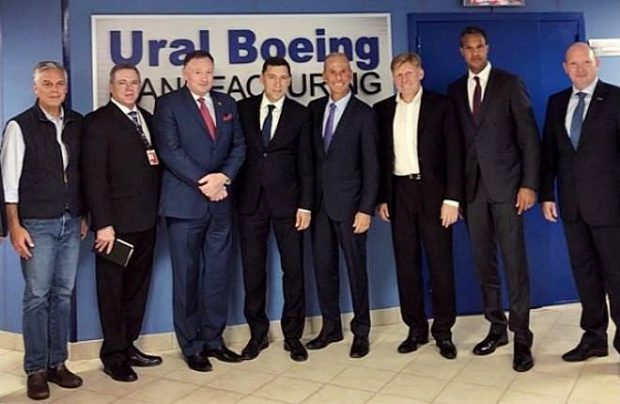 A second production site of Ural Boeing Manufacturing (UBM), the 50/50 joint venture between the American aircraft manufacturer and Russian titanium giant VSMPO-Avisma, has been launched in the Sverdlovsk region, Russia’s Urals. Because of the ongoing political tension between the USA and Russia, neither of the venture’s partners publicised the high-profile event which took place earlier this week, even though it was attended by a high-ranking American delegation, including John Huntsman, the USA’s ambassador in Russia, Boeing chief executive Dennis Muilenburg, Boeing International president Marc Allen and Boeing Russia/CIS president Sergey Kravchenko. The only initial clue came from Evgeny Kuyashev, governor of the Sverdlovsk region, who posted a photo on his Instagram account. The new facility is located in Titanium Valley, a special economic zone not far from Yekaterinburg. It will specialise in rough machining of titanium forgings for all of Boeing’s commercial programmes, including the narrow-body Boeing 737MAX and the wide-body Boeing 787/777Х aircraft types. According to Kuyashev, the new facility required an investment of 5.5 billion roubles (US$82 million). The original memorandum to double UBM’s capacities was signed at the Dubai Airshow 2013 with a view to launching the new site by 2016, a completion schedule which was later postponed to 2018. The 20,000-square metre site is highly automated and capable of final, as well as rough, machining of components. Boeing’s strategic partnership with VSMPO-Avisma dates back to 1997, and their UBM joint venture was legally formed in 2009. Commenting on the opening of the second site, Mikhail Voevodin, head of VSMPO-Avisma, emphasised that the event is one in a series of consistent steps which will extend the co-operation between the two companies, develop new technologies, build additional capacities and boost production outputs. Regardless of the importance of this milestone, and because of the continuing political tensions between Russia and the USA, neither of the companies has showcased the achievement. The April sanctions imposed by the USA on Russia have prompted the Russian government to propose restrictions on such co-operation in the aerospace industry. However, VSMPO-Avisma warned about the imminent negative effects of such measures and, subsequently, Denis Manturov, Russia’s minister for Industry and Trade, announced that the response to the sanctions should not affect VSMPO-Avisma and other residents of the Titanium Valley.